Install citation plugin (see below). 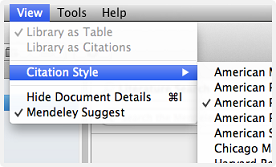 Select References tab in Word document and locate the Insert Citation button. Click Insert Citation button. Then, search for required reference by author, title or even year and press OK. The reference selected will now appear in the position the mouse cursor was originally placed. After at least one citation has been placed into your Word document, a bibliography can be created by clicking Insert Bibliography button under the References tab in Word. If more citation are added after the bibliography has been created, click the Refresh button under the Bibliography button in Word.